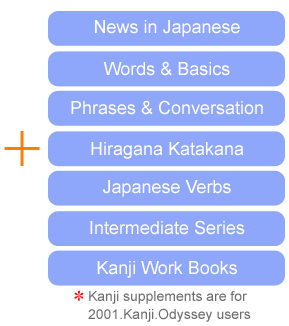 Both Hiragana and Katakana consists of 46 basic letters and several combination letters. The vowels are a, i, u, e and o. In modern Japanese, Hiragana is used for native Japanese words. Katakana is used for loanwords (words of foreign origin) such as Amerika (America) and Wain (wine). The long vowels are written in the following ways. Katakana - The long vowel is indicated by a symbol " - ". The double consonants are indicated by the small tsu. The particles wa and o are written in the following. Ordinary Japanese sentences are written in the following. There is no Space between word and word in the ordinary Japanese sentence.